Margaret Mead said, “Never doubt that a small group of thoughtful, committed citizens can change the world; indeed, it’s the only thing that ever has.” Public Media is built on a group of committed citizens working to ensure that everyone in our communities has access to lifelong learning. As boomers age and millennials seek a way to connect, public media is at a monumental point in our history when we must embrace innovative strategies to empower our citizens by leveraging the cornerstone of public media – education. Many of us are first generation PBS kids. We remember when Sesame Street started, and when we would come home from school to our favorite neighbor, Mister Rogers. Public media is in our souls. It is the fuel that drives our passion and our purpose. Leadership guru Simon Sinek said it best in his 2013 TED Talk when he described the importance of our purpose this way, “Why do you get out of bed in the morning? And why should anyone care?” Regardless of everything else that is happening in our world, our social status, or our education background, we each have a purpose. On November 28, 1967, the Southern Educational Communications Association (SECA) was chartered and incorporated as a result of the desire of a group of educational television station managers and educators to create a regional voice, to gain strength in unity, and to share resources. From the beginning, SECA member stations were the source for new content and strategies for the public media system. SECA and South Carolina ETV persuaded William F. Buckley to bring his weekly public affairs series, Firing Line, to public television and helped secure its first year of funding through CPB. SECA was an innovator beyond broadcast as well. By the fall of 1976, two years ahead of PBS, SECA was distributing four hours of television programming via a joint US-Canadian communication satellite project. This experiment was followed in 1981 by the creation of SECA’s Center for Instructional Communication, to expand the scope of SECA’s educational activities via the National Instructional Satellite Service (NISS), and to strengthen the association’s leadership role in educational and instructional services. The underlying purpose of SECA – education – was evident in all they achieved. The education purpose pervades all that the organization delivers for its members. Today NETA supports public media licensees in 46 states, the District of Columbia, and the U.S. Virgin Islands. NETA’s 2020 Strategic Framework aims at strengthening and amplifying public media’s education mission in the 21st century, just as SECA’s founding members intended more than fifty years ago. In support of this mission, CPB and NETA are hosting the second annual CPB Public Media Thought Leader Forum and 2019 NETA Conference on January 21-24 in Salt Lake City. The gathering, which attracts public media professionals from throughout the country, is designed to advance public media’s educational content and services. Interactive presentations and hands-on workshops will feature leaders in education, nonprofit strategy, fundraising, and business. Conference participants will explore new models of community engagement, digital content, and social media with a focus on expanding audiences. 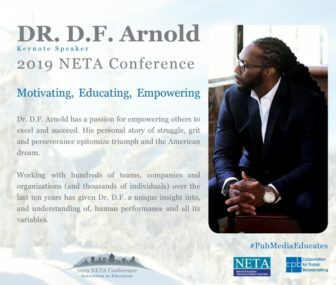 The 2019 NETA Conference and CPB Public Media Thought Leader Forum will provide a space for interdepartmental and multi-generational dialogue driven by our common purpose and the cornerstone of public media: education. Join us this January in Salt Lake City to discover and empower your purpose.